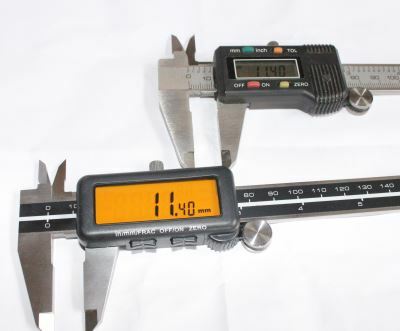 Must admit that I bought this as a bit of a gimmick as I already have a perfectly functioning digital caliper – machine-dro.co.uk Digital Caliper. The treat with this one is the large display and the fact that it displays imperial fractions. Difficult to write a manufacturer against this as there just isn′t any information in the case or packaging to let you know where it was made. Even the certificate of inspection gives traceable numbers and codes, but not so great when you don′t know where from….is that strictly traceable. The caliper arrived in a sealed plastic bag that was itself in a hard plastic case and this was in a cardboard sleeve. The difference in the size and brightness of the displays between this new orange display and the older grey unit from Machine-DRO is remarkable. This caliper is very easy to read. 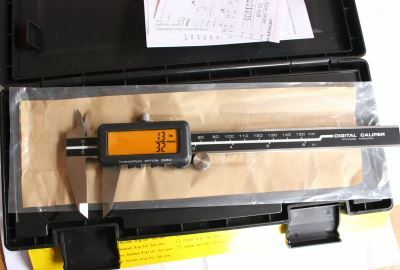 The plastic case around the display is quite cheap and the thumb-wheel is not that nice to use – it may take me some time to get used to this and for it to grow on me. 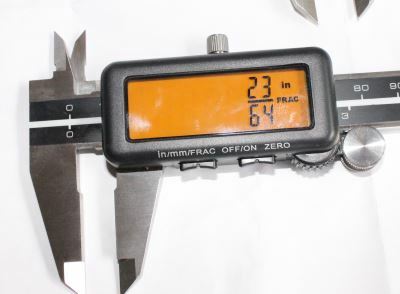 The imperial fraction display as an option was one of the reasons for purchasing this caliper. The fractions are useful if you are searching for a drill or piece of bar stock, but it really ends there. The play is quite large as the fractions only work to 1/64th inch and so you will find yourself switching back to a digital numeric display to read the correct size. 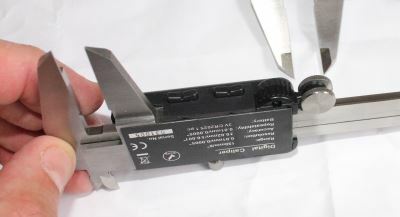 Price: approximately £23 from arceurotrade.co.uk/. A great display that you will be able to read even without your glasses on. The fraction display is ok for finding bar stock and drills, but it really is a gimmick. The biggest issue with this caliper is if you switch it off it resets to zero wherever the caliper was beforehand. This means that if you put the caliper down and then want a reminder of the measurement you have to leave it on and to use it as it will automatically switch off after a few minutes and when you switch back on it will have reset itself to zero.